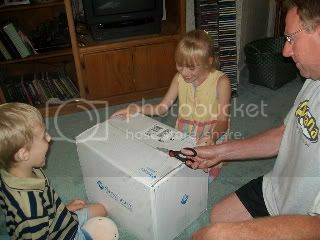 SonlightBlog.com: SHEER JOY on Box Day!! SHEER JOY on Box Day!! 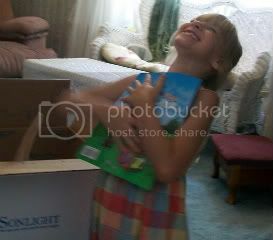 I simply cannot imagine that public-school children share the same thrill, excitement, and sheer JOY that my children experience when receiving new school books from Sonlight on Box Day! The entire family slept in this morning and missed the FedEx guy at the back door. But during breakfast, the box was discovered: "MOM! School books are HERE!!!!!" The children could hardly contain themselves! I only wish I hadn't been just as eager and excited. I may have taken better pictures! 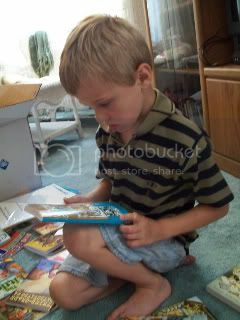 Shepard (Age 6) says, "SONLIGHT ROCKS!" Selah (Age 7): "I can't wait, Mommy! How 'bout I just read one right now?" Our start date this year is August 23rd. We are doing Core 1 Introduction to World History - Part 1. Also: Language Arts 1 and 2-Intermediate, Singapore Math, A Reason for Handwriting, and Apologia Science [Botany]. 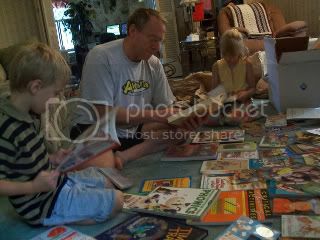 And Dad CAN'T WAIT to open up the missionary books! ...Pretty sure "George Muller" will be read long before week 26!